Description: Help Olivia find the perfect tango outfit. Make a selection between awesome saucy dresses, tight and curled hair styles, and flashy accessories! Instructions: Use your mouse to click on and through the floating hair, clothing, accessory, and background options for this spirited tango dancer. 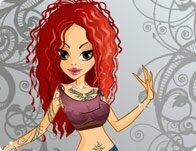 Create your own look from a wide variety of cool custom tattoo designs and clothing! No tow dolls ever look the same, whats your style look like?